Greg Sterling, of Sterling Market Intelligence, recently profiled on his blog, Screenwerk, our "quiet" launch of MerchantCircle 'Neighbors' - which will allow consumers to create consumer profiles and 'follow' their favorite local merchants. This launch, which is still in BETA, gives our merchant base a stronger connection to offer deals directly to their customers. If MerchantCircle is successful in getting consumers to join, create reviews, clip coupons and follow businesses, it will build considerable additional value for its merchants at no cost to itself. Read the rest of Sterling's post here or create your Consumer Profile now! Click here to get started. 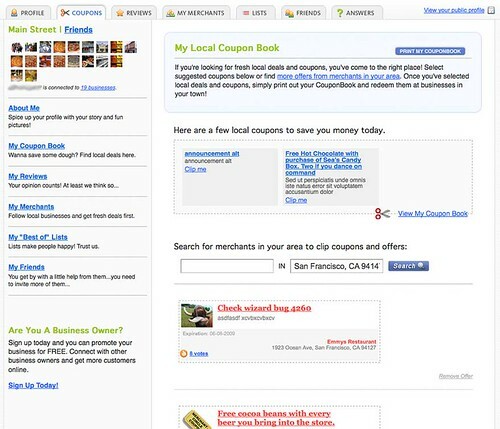 My Coupon Book: Consumers can clip deals and coupons created by you! My Reviews: Consumers share their thoughts about the best businesses in town. My Merchants: Consumers can “follow” local businesses to get updated news and events. Tell us what you'd like to see or improve in our 'Neighbors' program, here, in our forums.